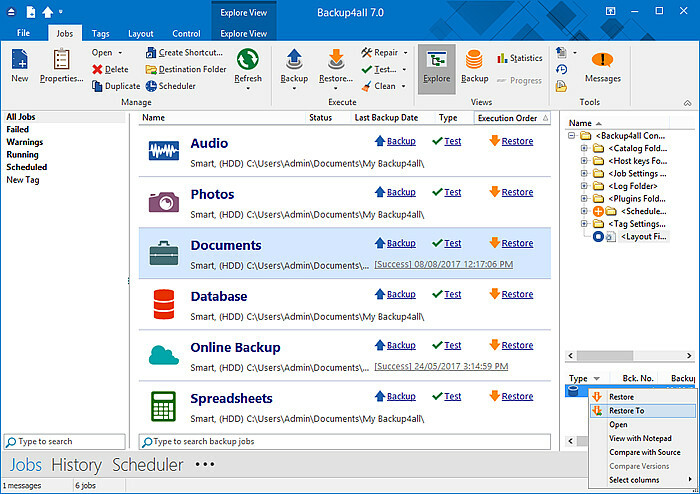 Backup4all Portable is a portable backup program that performs full, incremental, differential and mirror backups. Can be configured to automatically run a backup when USB is connected. Creates standard zip files or exact copies of files, spans to multiple disks, keeps track of file versions, has built-in CD/DVD burner, backs up to FTP, backs up open files, sends email notifications and has AES encryption support. Free Backup backs up any files and folders on any disks to any location(s), in Finder format or as Stuffit archives. iMsafe iMsafe backs up data stored on any mounted OS X volume (such as your HD) to any mounted OS X volume.